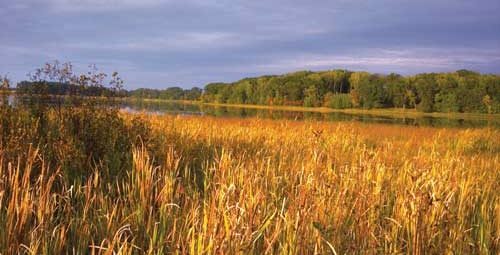 About one hour north of the Twin Cities, the Isanti County park of Anderson lies in a richly diverse environment that draws in throngs of migratory birds. This park, which was created only eight years ago, underwent an intensive transformation to be restored from a farm into the thriving ecosystem it boasts today. This hard work has paid off as park users now relish this natural place where it seems hard to imagine could have ever been anything other than natural. Earlier this year Parks & Trails Council of Minnesota began working with the county parks director, Barry Wendorf, to build on the success of this park by acquiring a critical 32-acre parcel on the east side of the park. This new addition will require virtually none of the intense restoration that the previous land acquisition required. This land has remained natural throughout its ownership history, preserving an area that will seamlessly blend with the current parkland. However, sealing the deal on this land was less than certain, despite everyone’s understanding of how crucial it would be for the park. The roadblocks came in the form of the county’s lack of funds and staff resources to coordinate land acquisitions. Plus this land was owned by four individuals, which can add complexity to the transaction, and they wanted to move quicker than the county could move. “For the Parks & Trails Council to come in with the funds and expertise to quickly and smoothly handle this, it’s beyond beneficially to a small county like us,” said Wendorf. It could easily have been sold for lake home development as it has the potential for up to eight lots on the lake. That would have been a big loss to the park to see the adjacent land transformed in nearly the opposite way as the current parkland. It was a lengthy process to restore the current parkland, requiring special equipment and several rounds of successfully requesting funds from the legislature. “Now here is this adjacent land that’s already pristine and with a landowner who want to sell; this is exactly why Parks & Trails Council has a land fund,” explained Brett Feldman, Parks & Trails Council’s executive director. This addition will extend the park’s eastern boundary into a strip of land that straddles two clear, shallow lakes. It will double the amount of park shoreline to 3,000 feet on Horseshoe and 3,300 feet on Horseleg Lake with the potential for a short portage trail to be created between the two. This would provide the only public access to Horeshoe Lake. Both these lakes are largely undeveloped with little to no motorized use and providing excellent habitat for waterfowl. The land being acquired has gone through several generations of the same family with additional investors added later. In the 1930s the land was used for breeding foxes, which were most likely used for their pelts. There are still some rows of cages on the property. But those are the only structures on the land. Since the 1950s the land has been used as hunting grounds with ducks and turkey being prime wildlife in the area. The land is mostly high ground that’s a mix of hardwood forest and native prairie with some wetlands. If all goes according to plan, the land will transfer ownership to Parks & Trails Council in July 2015. We will hold the land in trust and continue to work closely with the park staff to incorporate it into the park. This process could take up to four years as public funds and grants are identified. Meanwhile we will work to make sure plans for the park progress. Wendorf expects to add another mile of trail through this parcel, bringing the total trails to 4 miles for hiking, mountain biking, and horseback riding and groomed for both skiing and snowshoeing in winter.